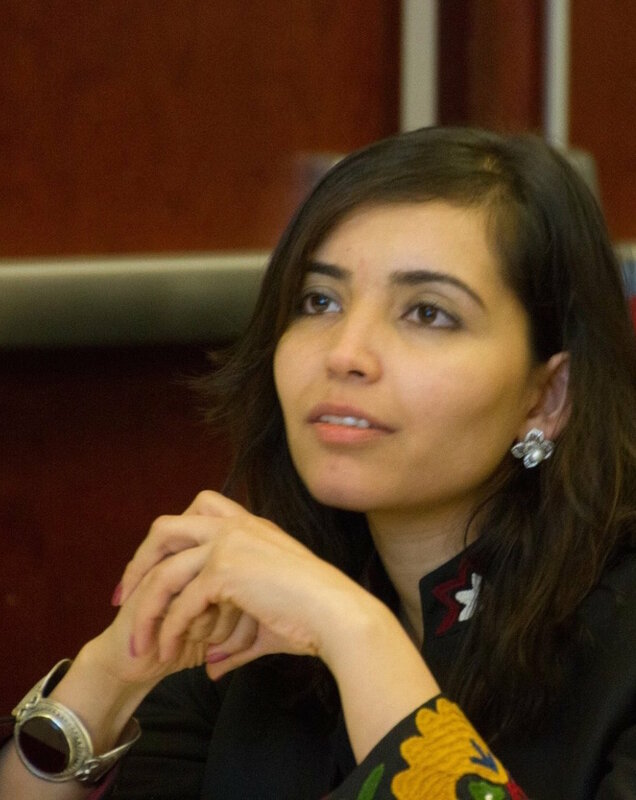 Salma is a 2015-2016 Fulbright scholar from Afghanistan, pursuing her Master's Degree in Public Administration at the Voinovich School of Leadership and Public Affairs at Ohio University. For the past six years she worked for the Afghan government as Monitoring and Evalution Advisor at the Administrative Office of the President and as Assistant to the Minister of Education. Salma Alokozai: My name is Salma Alokozai. RH: Where are you from? SA: I am from Kandahar, Afghanistan. RH: What is your current role? SA: I am a Fulbright student at Ohio University. I study public administration and public policy. RH: OK. Great. What was Afghanistan like when you were growing up? SA: I’ve seen different phases and different situations in Afghanistan. First, when I just started going to school as a kid, it was a civil war and people were leaving the country so we were going through a lot. It was a terrible war and I remember terrible memories because two of my family members got injured during that war. And then when I was at an age where I loved going to school and growing up and becoming someone, I really wanted to, in my teenage years we had the Taliban regime and I had to stay home and couldn’t go out, couldn’t go get educated and couldn’t go to school. Then there is the current phase. There is the post-2001 phase which started very nicely and we were so hopeful. I still am hopeful. The most beautiful things happened and I could go back to school. I could start my education and now here I am – I am getting my master’s. So I’ve been through all of these different phases of my country and I’ve seen them and I have been through it growing up. RH: What was the government like, if there was one, during the period of the civil war? SA: During the civil war I wouldn’t call it a government. There was no government. It was all the militia groups – different groups of mujahedeen who were controlling different parts of the country. I’ve grown up in Kabul, the capital. There were different groups controlling different areas in Kabul. There was no government at all. It was the groups fighting with each other and there weren’t any governmental services. There was chaos going on so I wouldn’t call it a government. RH: OK. Do you remember what it was like when the Taliban first arrived and rose to power? SA: Yes. Since we were going through a very bad civil war and people were very unhappy about the situation, we heard about a new group of people and they said that they were Taliban. People were talking that they are good and they might bring peace so everyone was kind of hopeful. I remember people talking about them but then once they took over Kabul where I was living with my family, the first thing they did was they came to our house and they took my dad with them. They beat my dad and then my grandma and my family had to go to them and beg them and request to let my dad go because he was innocent. He had nothing to do with the previous government and he’s just a schoolteacher. The first thing that happened was that the first night that the Taliban took over, the next day I wasn’t allowed to go to school. I couldn’t go to school anymore and was asked to stay home. That is how it happened and as we were growing up I had to live in that situation. Not just me but all of the girls and even boys. We had to stay at home and just dream about our future. There was no hope that we could get educated and then get higher education and then become someone professional in the field that we really like and that we really want. So that’s how I went through these years. I stayed at home, I read books and hoped for a day when I would be able to go back to school before I became thirty or forty years old when it was too late for me to go after my dreams. So that was how it was going on but then at the end of the regime, lots of people were leaving the country and going to other countries like Iran and Pakistan and these neighboring countries or the US and Canada. The city was becoming so empty and everyday my dad, when he would come home at night, would be upset because all the people were leaving the country and he thought we were left alone there and he was very afraid and worried about everything. RH: Alright. Before we get to 9/11, how did other people in Kandahar feel about the Taliban? SA: Let me make a correction here. I am originally from Kandahar but my family had been living in Kabul for the past thirty years. My family and I used to go to Kandahar, travel back and forth, so all the people all over the country felt the same. Everyone was upset about how things were going on or how people were being treated. Mostly we had the same feelings. If you would ask other girls growing up in Afghanistan during that regime, they will tell you almost the same thing. RH: Before September 11, did you personally have any interaction with the Taliban? SA: No. I was very young so as I child I would go out and my mom would ask me to go for some shopping or something. We all tried to not see them, not face them on the streets. Overall we stayed at home. We wouldn’t go out except for the male members of the family who would go to bazars and shopping malls and bring whatever we need or work outside the house. We, the female family members, wouldn’t go out that much or we wouldn’t go far so that we wouldn’t have to have interaction with them. So no. I did not have personal interaction except for the time when they came and took my dad and I saw them. I was crying and asking them to not take my dad with them. That was the only time when I saw them. RH: Alright. Where were you on September 11? SA: I was in Kabul. This one morning we woke up and a few days back something happened. One of the commanders of the Northern Alliance was killed by a suicide attack. It was very shocking news for people and for my dad and my family. They would talk about it. My dad used to listen to the news on BBC news through the radio because we were not allowed to watch the TV or anything. So we kept listening to news about him and then the next morning on September 11th when we woke up, we heard about this attack and that was very, very shocking. After that we heard President Bush’s speeches and how things are going to change so we were expecting things to happen. Then a few days later or, I think, the next month we were sleeping when I heard the airstrikes and the sounds of the airstrikes. So we were very, very scared and frightened because of those airstrikes and no one knew if they would target the government places or the Taliban, not the civilians. So that is how things started. RH: As the bombing went on, did the Taliban quickly leave Kabul? What was their evacuation like? SA: I don’t know if I exactly remember but within a month or so – I think within a month – they left Kabul. RH: What was the feeling among people in Kabul after they left? SA: Because Afghanistan was a country with a very long history of war and chaos, we were afraid that the Mujahedin will start fighting for power once again. But also everyone was so happy. I remember the day when the Taliban left and the US and NATO took over Kabul, people were very happy. For example, men were not allowed to shave their beards and women were not allowed to go outside the house without the burqa. That day, you would see all these young men sitting and going to shave their beards and have their favorite hairstyles. People would buy TVs and start watching TVs or movies and listen to music very loudly and do all the things that they were not allowed to do. So everyone was very, very, very happy. I really remember that day. I was the happiest one because I knew the next day I was going to go back to school. I remember those days when we started going back to school and how the officials – for example, people from the UN, all these different international organizations – would come to school and meet us and bring us stationary. That was kind of good news for me and the beginning of a bright future for me and my country. Those days were very good ones and people had lots of positive thinking about everything. RH: Nice. Do you remember the first time you saw or interacted with a US soldier or somebody from NATO? SA: Oh yes. That was a school week. So they asked us to go to school on a Friday and usually Friday is the off-day in my country. They asked us to go to school on Friday because mister Kofi Annan – he was the UN Secretary General at that time – he was coming to meet us. They called us and we went to school and that was when I met US soldiers and people from NATO and the UN guys and also Kofi Annan. And of course, they were treating us very nicely and talking to us and asking us what we need and what we think and trying to tell us that they will change the situation. They will bring changes in our school and in our classrooms. RH: Nice. OK. After the initial invasion, how did life change in Kabul? SA: In Kabul, of course life changed a lot. I always talk about this in my classes here in US. There are lots of big achievements like freedom of media, freedom of speech, women’s rights, education – especially education. Now we have over ten million students going to school including girls while at that time, the percentage was zero. Now women can work and go outside their houses, go to restaurants, go to wherever they want, dress the way they want. We have our freedom of choice in many cases and that is the most important thing. Once you remove from someone their basic rights, life becomes very hard for people. These changes and these freedoms, their basic rights and their access to good things like education, higher education, scholarships and having a government that they elect by their own vote – not a government that is taking power through war and killing people or a regime that is totalitarian, that is cruel and that would treat people very badly – is important. So life has changed a lot. I cannot explain how it is but these are all the things that I like and I am happy about. Of course, there are a lot of things that need to be changed and of course there are still people and especially the youth who think that with the money coming to Afghanistan after what happened in 2001, we could have a much better country and a much better situation. So lots of problems are not solved yet but we are happy for all the achievements that we have. If you would want me to exactly talk about the changes, I remember an example from one of the articles that I was reading for one of my classes a few months back. In this article, it is written by an Egyptian author and she is talking about Miss Laura Bush’s interference in Afghanistan and women’s rights. She says that Afghan women or Afghan people did not need to be saved from anyone. She talks about the Taliban regime and how wearing the burqa and everything is a culture and a cultural thing rather the Taliban forcing women to wear them and that women voluntarily wear these. She talks about these things. My criticism was that, no, that is totally wrong because we did need to be saved. We did need to be paid attention to and that is what you would hear from people in my country. Once, during the civil war, the US left us alone and look what happened. So the US should be careful because we are located in a place where we would usually be in danger and be at risk of being used as a country for negative goals and insurgencies. So yes, that is what I think and that is what it is about Afghanistan. You can say we didn’t need to be saved but we really needed to be saved and we were saved – at least me and girls like me and youth and the people of my generation. RH: OK. This actually is a perfect lead-in for my next question. For Americans or other foreigners who may not have the opportunity to visit Afghanistan, can you discuss what day to day life is like? SA: Day to day life? It is actually very normal except for the days when, unfortunately, some kind of terrorist attack happens and we all get upset and depressed and worried. But still, the next day you will see students going to school, girls with the school uniform, boys with the school uniform and young guys and girls going to university and other people going to their workplaces, their offices. At night you will see the restaurants are very crowded and the shopping malls are crowded. We have this area called Share Naw. That is the place where you would usually find shopping malls and expensive restaurants. It’s an elite area. You will see this big crowd of youth there. Life is normal except for a few cases of insurgencies or people being killed in the provinces in terrorist attacks. Even with that, the next day we go back to work with the same spirit – with a spirit of working for the country, with the spirit of getting educated and with the hope that things will change and that there will be one day when there won’t be any suicide attacks or no one will be killed at all. We are hoping for the best is to come and for the war to end which I am positive about and which I am hopeful for. RH: OK. Good to go. So you obviously graduated from secondary school. Did you also attend Kabul University? SA: I graduated from high school and then I went to Kabul University for one year and a half. Then I had to work, too, because I had to support my family, so I had to leave Kabul University and I found out about the American University of Afghanistan. I went to American University and I studied political science, actually. Then as soon as I graduated I got a Fulbright scholarship and I came here to the US for my Master’s. RH: Did you do any work in Afghanistan with any NGOs or anything like that? SA: Yes. Yes, I did a lot of work. First, I used to work with media and then I used to work with the current president in his election team in 2009 when he was a candidate for the presidency. After that I started working with the Minister of Education as assistant to the Minister for four years. Recently in 2015 I started working with the President’s office for a few months and then I came to the US. RH: OK. What are some of the things that you did in some of those roles and is anything really notable? SA: Yes. In the Ministry of Education I used to work with the Minister’s office as his point of contact and I was responsible for arranging the meetings and events for the Minister. So I used to see more than a hundred people every day and talk to them about their problems and take their problems to the Minister and to the higher level. I tried to follow up and solve their issues or take them directly to the Minister to talk about their problems and try to solve their problems in one or the other way. I tried my best and I think that was one of the best opportunities to work with civilians, with ordinary people, with the citizens – students and their parents – and help them. And since it was about education, I got involved with the education system, with the policies. I got to know how things work and how things don’t work, what are the problems and what could be the solutions. So it kind of was a clue for what I want to do in the future. That was one of my goals and arguments presented to the Fulbright community – that I would be working on women’s education when I go back to Afghanistan after my education is completed here in the US. So that was that. In the President’s office I was working as a mini-consultant and we worked with the President’s office to bring changes both in the President’s office and around the government. We worked on monitoring and evaluation on policies, making job responsibilities for employees of that office and how we can monitor outside that office and other governmental institutions. I worked for some surveys and researchers. I don’t know if they are something big but they are something that I could do at that time and in those positions. RH: Alright. Good to go. You talked about this earlier and touched on it but can you talk about the role of women in Afghan society and how that role has changed since 2001? SA: Yes. There is a big change in the role that women play in society since 2001. Like I told you, now the important thing is that they get educated because once they get educated, they know what their rights are and what roles they can play in the society and how they can support their families. They know themselves. They know their power, they know their rights and their roles. So that has been changed a lot in big cities, especially. In Kabul of course it has changed a lot and in other big cities as well we have women who are very much involved in civil society. We have women on the government level. We have lots of women in parliament. We have female students like me traveling outside the country for higher education, going back to the country and working on good positions and for bigger goals and objectives and are bringing a change. But also there are still women who do not have access to their basic rights, who still face violence, who still go through hardship and who still go through poverty. We still have the highest mortality rate. I wouldn’t say that their problems are completely solved and that all the women are very happy or that there is no sexism. They do but their role has changed a lot. RH: OK. You talked a little bit about this too but what are some of the current challenges that women in Afghanistan are facing? What are some of the ways, in your opinion, that these challenges can be addressed? SA: First of all, security. For example, a few days ago there were three girls in Kabul city that some guys injured by throwing nitric acid on their faces and they don’t even know why that happened. These kinds of things still happen. There was a young lady last year who was shot dead for no reason. Women still do not feel safe because anything can happen at any time, even in Kabul. Because of the insecurity and the high risk of losing their lives, they would try to not do things that they can do or work at places where they have all the education, qualifications and the skills for. But just because of the security, they try to stay away. Also, domestic violence as I said and discrimination at every level starting from the government level, society level and even in some families still exist. In most of the provinces where the government isn’t able to secure the schools, the girls are not allowed to go to school. Their families are afraid that if they go to school, the insurgents might do something to them. Or sometimes there is still this culture of child marriage and families marry their daughters at a very young age and they can’t go to school and they get busy with their married life and children. So these kinds of challenges still exist there. RH: OK. You said you want to work in women’s education. What are some of the ways that women’s education – actually, this is going to be a two-part question. What are some of the ways that women’s access to education and then women’s actual education can be improved? SA: Women’s access to education can be improved by increasing the number of police and security forces at the provincial and district level and hiring specific forces to safeguard female schools. That is how things can improve because that is the only way. That is how things started in the beginning. At our school back in Kabul, we had a police post nearby our school and they would try to safeguard the school and take care of the girls going from school to their homes and from homes to school. They would make sure that no one harasses them or does something bad to them. So I think that is how things can improve in the current situation. Actual education, I think that we need to work with society, with families, with the religious people in society because religious people play an important role in how people see things. I want to work with mosques in the district and provincial level and to invite male family members to the mosque and, with the help of the mullahs and religious leaders, talk to them about the importance of education and the importance of higher education. Some families believe that if the girl goes to school and finishes her secondary school then that is the end of it for her. She can at least read and write and that is enough whereas that is not enough. In a country like Afghanistan we need labor. We need skills and women make fifty percent – more than fifty percent – of the population. So how come in such a country, fifty percent of the population do not work at all and just sit at home and consume? That is not possible. We need women to get higher education for both economic improvement and for societal improvement. They are going to be the future mothers in that country and they are going to give the next generation, present the next generation for that country. That generation needs to be a good one, a generation that can take the country to prosperity and to a brighter future, rather than the ones we had in previous years, rather than the generations who were thinking of war and thought war was the only way and solution. So I think working with religious leaders and mullahs and using mosques as platforms is another solution to advocate for higher education. RH: From your work with the mosques, do you have any specific stories? What were the reactions that you got? SA: From my work, not exactly because I was just working as assistant to the minister and I wasn’t involved in advocacy or working at a policy level. I didn’t work in policy or planning or anything like that. But there were some projects where the international organizations would try to work with the mosques and the religious leaders on these issues. Historically, Afghanistan is a country where, whatever the religious leaders say, that is accepted and that is implemented. So I think in this case we could do the same. We can use religious leaders in mosques as a platform to make people accept education as an important thing and as necessary as everything else that comes through religion. RH: Alright. Since 2001, what are some of the notable events that have happened in Afghanistan or maybe some of the notable events that you’ve been through? SA: Notable events in Afghanistan since 2001? Of course, there were several loya jirgas where, first of all, they started making the new constitution of my country. I remember how eagerly we all watched that whole event because the leaders of that country were once again sitting together, negotiating and talking about the issues in making a new constitution after a very long chaos. And also, the 2004 elections. The parliament for the first time we had a democratic system and we had the lower and upper houses, both houses of the people, and we had elected their members. We had the next presidential election in 2009. I went to these presidential campaigns and I saw how people would work and try to work for their favorite candidate. For the first time they had a favorite candidate and they could choose the leader for themselves. The very big one was the 2014 election. This election was a kind of complicated one but we were excited because for the first time we had a peaceful transition of power. All of these events were very big events for us. I told you about the story of me going back to school. That was also a big event – the schools were open again for all the kids, girls and boys, and we were going back to school. So that was also a big event for me. More than that, in civil society there are the events that show how we are starting to believe in our rights, in democracy, in how we stand for the good and bad and how we do not use weapons. Instead we use our rights of demonstration and protest that we don’t want to happen. Those events were also some big ones. The events that happened after Farkhunda’s killing, the demonstrations that happened after those women were raped. There were big demonstrations all over the country. And then the demonstrations that happened when I was here in the US. There were several issues and we had big demonstrations. People were very peaceful and calm and they were friendly towards each other. These are all these very big and good events. RH: Alright. Good to go. How do you feel about the withdrawal of US and coalition forces and the direction that Afghanistan is taking? SA: I’m not very happy about the withdrawal personally because I still that we are not as strong military-wise and also politically, too, to defend the country against all the risks that still exist for Afghanistan. Actually, I was happy to hear the news about leaving additional troops in Afghanistan. I heard President Obama’s speech the other day and that was good news because I think we still need a big number of international troops in the country to train our military and national forces and to help us go through the insecurities and the risks that exist. Also, that is something that other countries will be scared of and will not try to attack Afghanistan. Our neighbors are very strong military-wise and they can do anything any time they want so that is a big concern for many of the youth in my country. RH: Alright. Good to go. What is the greatest challenge facing Afghanistan today? SA: The greatest challenge is the existence of the IS and insurgent groups in the country and the insecurity and instability. That is the greatest challenge because once we have security and once we are not afraid of being killed for working for the government or not being afraid of dying in a suicide attack when we go to the office or when our kids go to school, we can accept and go through any other challenges or problems. We can work for that. It is exactly because of the insecurity and because of the suicide attacks happening in the country that lots of people leave the country to try to go to other countries that they think are peaceful. Many of our youth go to other countries and instead of working for Afghanistan, they go and work in other countries. We need them. We need human resources for that country and it’s not happening just because of the insecurity. RH: Have events in the Middle East over the last four years affected Afghanistan and, if so, how? Specifically, the rise of ISIS and some of the issues that they’ve brought to Syria and Iraq. SA: Yes. I think that, first of all, the Arab Spring and the war in Syria, had a big impact on Afghanistan’s situation because somehow the international community’s attention was drawn to Syria more and Afghanistan went to isolation once again. Everyone was focusing on the Arab Spring in the Middle East and that was the biggest fear of the Afghan people – we will be forgotten once again and we will go back to that chaos because we are still not that strong to stand on our own. I think, as you said, their rise in Iraq and how they spread all over the region was also a very big thing that impacted the country. Because now we don’t only have the different insurgent groups to fight with or to negotiate with but we also have the rest of IS. That is another big challenge for the Afghan government and the Afghan people. Moreover, the US election is also something important for the people. I think it’s going to bring a big change in Afghanistan’s situation and how the US deals with issues regarding Afghanistan. RH: Alright. Good to go. I have a couple of spiritual questions for you. Has the war affected you spiritually and, if so, how? SA: By spiritually, do you mean religion-wise or just how I think about things or how? SA: Religion-wise, I think the wars and the situations made me do more research about my religion and think more about my religion and try to find what the reality is, what the religion really is about. Of course I wouldn’t believe that my religion or any religion favors killing people or doing all the negative things that have been happening. I don’t think any religion would spread that kind of negativity. Those things and my background, my history and my country made me do research about my religion, know my religion more and question things and find my own answers not based on what others would tell me but based on the evidence and based on the interpretations that I would read myself and find through my research. So I think I believe overall my religion and none of the other religions believe in or favor killing people from any religion or any group. I think religion does not prevent or abandon women from going outside or learning something or getting educated, working or anything. I believe that religion is something that we really need to focus on and think deeply and rationally about. The whole country, the whole world, needs to think about their religions deeply and reconsider some of the issues. Moreover, as a social person, my thoughts and my spirit outside the religious context, I used to be an ambitious person. As a kid and as a teenager through all these hard times and wars and everything I and my family and my people went through, I was positive and always dreamed about a day that I would be where I am today. I am so lucky that I am where I was thinking to be. I still am a positive person. You know, these wars and everything that happened have made me a more humanistic and kind person. I now know the value of humanity even more. I now even more believe in humanity and because we did not have the freedom, now I believe in freedom even more and I will do anything for to keep my freedom and for my rights. I stand for my rights. I stand for the rights of my people. I stand for the rights of every human being. I think those experiences have made me a good person. Those experiences have made me a strong and ambitious person who believes in a good future for herself and her country. RH: Has the war changed our perception of life and death and, if so, how? SA: Life and death? Coming from a country where death is possible any moment, I now believe that – and seeing lots of people dying in every corner of the world nowadays – I really don’t know what I think about it but all I’m hoping is that I don’t want to see people being killed. Natural death is something that could be acceptable. I am scared of death, of course everyone is. But still, a natural death is something nowadays that we would be happy about rather than scared because being killed is so common. People kill people everywhere that you rarely die by a natural death. I hate this word so much nowadays because I hear a lot about people dying, about people being killed. Life is, I think, about being a good human being, working for humanity, doing something significant for other human beings. I think life is meeting new people, making networks, meeting people from different countries and finding out that there is so much in common between us human beings. It doesn’t matter if someone comes from Central Asia or another from north Africa or a country that I might have not even heard about before, we would still share so much in common. We human beings are just fighting for borders and power and meaningless things. It is all politics and useless. Life is just about humanity, friendship, being together and doing something good for other human beings. RH: That’s great. Thank you very much. We’re actually going to shift gears and get a little positive for a moment. What are some of your happiest memories of living in Afghanistan? SA: My happiest memories are from those days when I was with my family, my siblings and my parents. Every moment with them is a happy memory and my moments at school in my classroom with my classmates. Especially sometimes when we would be so tired and hoping that the teacher would not appear and, when she would really not come to the class, we would just have fun and play jokes. [laughs] Those were some of the memorable moments with my classmates. But also from my university, from American University, when we would have all the hard debates about politics, social issues and everything. And then after the class, my classmates would go back to each other and tell each other that we don’t have anything negative – we were just debating. And so the friendship and those moments that I spent with my classmates and friends in my university, all those moments in the classroom were memorable and beautiful. Some of my good memories come from people I met in my office. I remember one day I met a lady who came to me crying because of her problem. I tried to solve her problem and I worked with her and she would thank me and cry and pray for me. That has happened a few times and that was when I would feel gratified with my work. Also, the moments I spent with my friends. In Afghanistan, in spite of all the negative things that people hear about it, we do lots of fun things. We go out. We hang out with friends at night after work. Sometimes we would just turn on the music and dance like crazy and just have fun and enjoy the time with our friends. Sometimes we would go out for a nice dinner. Sometimes we would just sit at home and watch movies with friends. These are all very nice memories I have. RH: Nice. Do you have any funny stories of Afghanistan? RH: Alright. Good to go. Aside from the US, have you traveled to other countries maybe in Europe or Latin America? SA: Outside of the US, I have travelled to Asian countries, to the United Arab Emirates, to India and Pakistan but not to any European countries yet. RH: Coming to the US from Afghanistan, what were some of your impressions and what are some of the big similarities and the big differences? SA: So we were told that we would have a big culture shock and sometimes students go through depression because they don’t find a connection and miss their families and all those things. But when I came to the US fearing that I would also feel the same, the shocking thing for me was that I was not shocked. There were just a few things that had shocked me. Not the western culture but expecting the US – a country that is very powerful – we think that everything goes so perfect in the US and all the people are so rich and have a good life. For me the only shocking thing was seeing homeless people in the US. Then feeling very sorry and very bad about them but also feeling blessed for myself coming to the US and studying here. It would really depress me seeing them around because thinking, how is it possible in a country like the US that so many people could be homeless? But I’m sure there are these kinds of things in every country and every society. That was the only thing that I was a little shocked about. Sometimes it’s hard for me to follow up on the normal conversations between two Americans. [laughs] But overall it is a very nice experience. I find commonalities in, for example, I would think that the US is about individualism and there is no family life at all but that is not true. There is family life and people will do anything to keep their families together and to keep them happy. There was also this fear that maybe US people might be a little ignorant or maybe they might have an attitude towards internationals or something. That was not true. I have been so blessed and honored that I have met people in American families who were so caring. They helped us a lot and they took care of us. They invited us and made dinners for us. They were so nice to us and I still keep meeting new people and they still prove that Americans are also as nice as other people and that they are not ignorant. These were the few things that I had a perception about but then I found out that it wasn’t true. The funny thing is that when I came, the first day I arrived – not the first day – but the first day that I arrived in my own city and my own school, my friend told me that I can watch some TV serials on Netflix. The first one that she said I should watch was Friends. That is one of the dramas that I have been so addicted to. It is giving me a US cultural context. It talks about the US cultural life but I also find so many common things in that with my friends, with my family. I feel connected to that serial or drama. These are the things and those are the things I was shocked about and a few things – not the few but so many – that I find common and I can still be connected with. I believe that if I go back home, I will be missing the US. I have traveled to different states in the US. I have had very nice moments here with internationals, with people from Afghanistan, with Americans and all those nice moments. I really like the natural beauty of this country. It is so green and it has a lot of variety. You will see different natures in different states. I’ve been enjoying it. RH: Alright. Let me ask you this. What are some of the common misconceptions that the average American might have about the conflict and what the people of Afghanistan have gone through? SA: So the common misperceptions or misconceptions about Afghans is that people think that Afghanistan is a country where there is no normal life and that there is always war, people die and everything negative about that country. They just know women wearing the burqa. They know the burqa as a representative of that culture. That is not true. I oftentimes talk about it in my classes, especially if I take any class on women’s rights and feminism. One day one of my American professors told us a story that one of the students had asked one of the Afghan students if people from Afghanistan use a toothbrush and toothpaste and that was the funniest one. I was like, “Wow,” because now with social media, everything has been so easy to find out about all the different cultures that you want to know about. So the women’s rights, women’s issues, the insurgencies, suicide attacks and how it is normal for Afghans in Afghanistan, is a common perception. If a suicide attack happens in Afghanistan and if people are killed in there, everyone deals with it so normally and they wouldn’t say anything about it or even be shocked about it. People thinking Afghanistan is a place of violence and terrorism is what hurts me and is also very common among people in the US. But then I try to talk about it with people. I try to talk about all the good things that exist there in Afghanistan and I’ve always tried to show that positive image of my country, that real image of my country, because I know terrorism is something new in my country and it has happened because of all other factors – not because my people want it or that we wanted it or that it is our thing. And I also talk about how women have their own role in society. It’s not that they just wear the burqa or sit at home and that’s it or that all the people there are uneducated. That’s not true. So, yeah. These misconceptions and misperceptions exist. And also the fact that they see a woman or a girl like me or my other friends from Afghanistan here studying at school in the US and the way we are clothed or the way we talk or the way we are involved in our schools and in our classes, it is surprising for people because they have that image of a woman in a burqa in Afghanistan but that is an old image. The new image is this one. It is us. It is the women that work back in my country. RH: Alright. Good to go. If you could communicate something to US policy makers as they think about their next steps in Afghanistan, what would it be? SA: First of all, I would say that one thing I found out very interesting and really, really good and impactful for my country is the scholarships for the students because the youth really need to go outside Afghanistan to think outside of the box and to see the country from outside and learn from outside and then go back and work there. I would spend more money on educating the youth and trying to provide them with good higher education. I’m really happy for the Fulbright scholarships or other scholarships from other countries. So an increase in the number of scholarships would be one step because once you educate the generation, lots of things will change and lots of issues will be solved. The second thing is about the security. For the US policymakers, I would suggest that they consider and think about their military cooperation with Afghanistan and not leaving and isolating the country once again. If they do, the history will repeat. That is what will happen for sure. The third thing is finding the main cause, the main source, of insurgency and terrorism and working with Afghanistan to deal with it and working with the neighboring countries of Afghanistan to deal with that. Everyone knows that Afghanistan cannot be blamed for what has been brought to it for all the politics going on in the region. We are victims of the Cold War and, now, the victims of terrorism and war against terrorism. We have been victims for years and years and it is because of the politics. It is not because that is how we are. It is not because our people are doing bad to themselves. It is just because that is what we are used to. We are kept uneducated and we are used whenever politicians around the world claim that they need to use us. So I think that first educate us, second find the main source of terrorism and insurgency and fight that even if it is inside or outside the country, outside Afghanistan, and please do not isolate the country. RH: Alright. Wonderful. If you could communicate something to Afghans going forward, what would it be? SA: To Afghans, of course I want them to believe in themselves, to believe in the future of their country, be honest to their country, to be patriotic and work for their country. I think it is us, the Afghans, who can make that country. We should make it. No one else will come and make it for us because it is no one else’s country. It is ours and we should. We are responsible to build it, we are responsible to educate ourselves, we are responsible to improve our lives and we are responsible to catch up with the rest of the world. We should do it and let’s do it. There is a lot of hope and there is a lot of potential in this country and we should not give up on this country. RH: Alright. Good to go. Do you see a way forward for peace? SA: Yes, I do but I don’t know how long it will take or how. I think negotiation and settlement is of course the first and wise option for solving the problem because I do not want more people to die. I do not want our soldiers to be killed and I do not want other people – even if they are insurgents – I don’t want them to be killed. I just want them to realize and to get back to their normal lives and stop killing people. So I would always encourage the peace process and I think it is possible with the help of and, of course, the commitment of the Afghan government, the Afghan people and then the international community and our neighbor countries Iran and Pakistan and whoever is there who can help us with this and who are very much involved in our politics. There is a way out but first we should find the reasons behind the insurgencies going on – the main sources, the places – and who is who. Then we can find out how we can go towards peace and, yes, the possibility exists and I would want it to work because I believe peace is much better than going to war against anyone. RH: Alright. Good to go. Before I ask my last question, is there anything I left out that you would like to address? SA: I think we addressed all the issues. I don’t remember anything not being asked that I should talk about. RH: Alright. Good to go. So my last question is, what specific accomplishment are you most proud of during your work in Afghanistan? SA: I’m so proud of being an active member of my society. There were times when I would give up on my work and go and stand on a protest or a demonstration or go and do something like volunteer for the city – for example, for the kids. As a youth, I think that is something to be proud of. Every young person and every person who has the ability to do something free of any kind of expectations or economic interests is something good. RH: Perfect. Before we wrap it up, anything else? SA: No. That was all.